Near Dunn's River Falls. A massive underwater plateau rises up from the sandy ocean floor to 60 ft. (18 m ) below the surface. The top of the reef is covered with many different species of soft gorgonians and small coral heads, consisting of sea rods, sea plumes, sea fans, brain coral, star coral, and clusters of smooth flower coral. When you swim along the edge towards shallower water, look out for the golden hamlets that frequent the area and the uncommon yellow cheek wrasse, other wise only seen on deeper dives. Hiding in the coral heads are glasseye snappers, graysbys and squirrel fish. 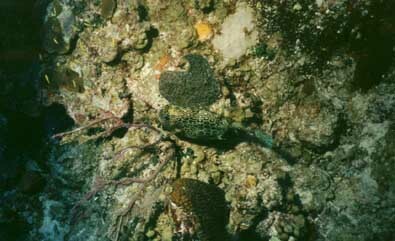 In the shallow part of the reef the area is sandy, with some low-profile hard coral. Besides all the regular damsels, indigo and shy hamlets move about in the company of rock beauties and red band parrot fish.